I know you have just been on pins and needles waiting to see what color I painted the game room doors. 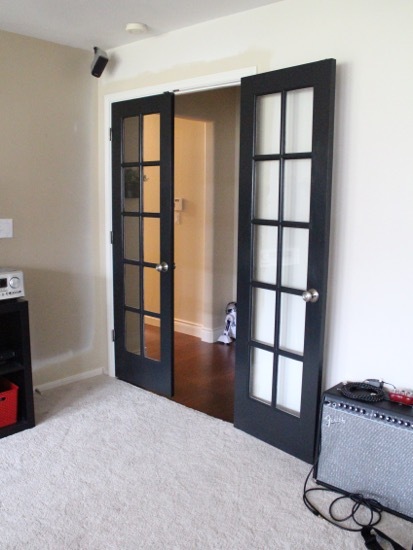 When I last left off, I was debating whether to paint the french doors or stain them. 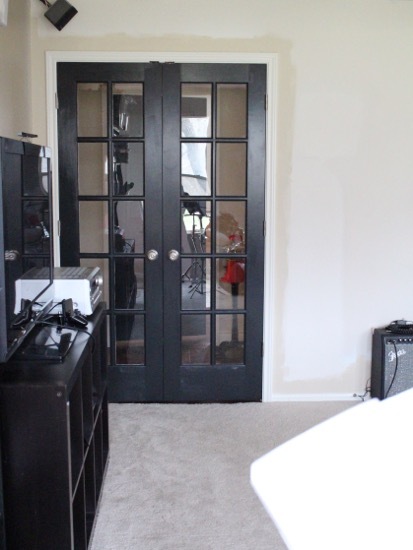 Here’s that post if you’d like to see the process of installing the doors and then me hemming and hawing over what color to paint them. If you guessed “paint them black” then you win a cookie. 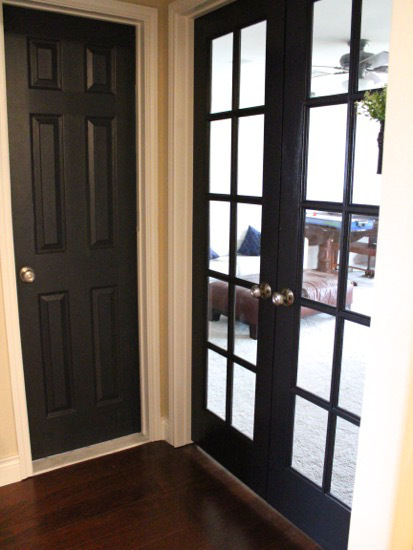 I really love the look of stained french glass panel doors, but I just couldn’t commit. 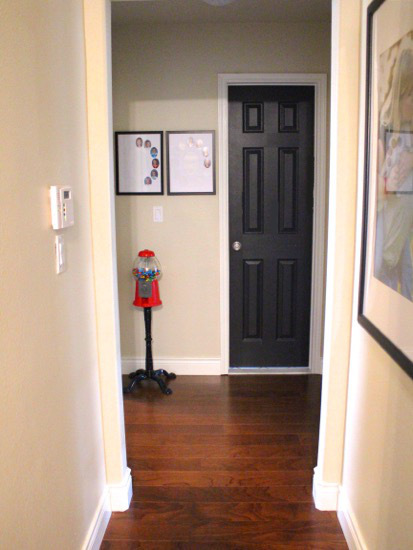 I felt like they would compete too much with the wood floor, and they would look out of place in our style of house. But boy they look good black. I am smitten. I have been obsessed with black doors for years, and I doubt the obsession will end any time soon. 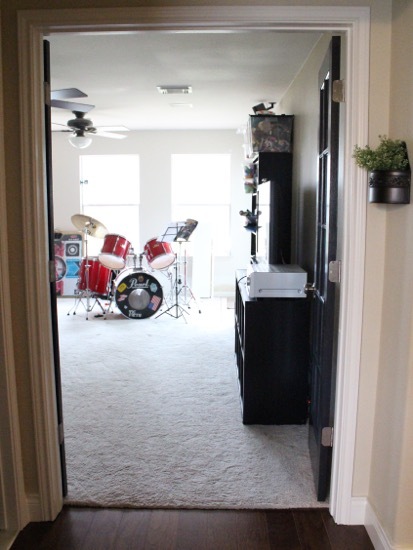 The game room is at the end of the hall, on the right. Here’s a good view of the hall as you are walking down it. You can’t see the doors at all until you reach the end of the hall. The door you are looking at here is a bathroom. Can you believe I still have that gumball machine? It is one of the very first posts I ever made here at House of Hepworths. We’ve had it 5 years now and I still love it as much as the day I bought it. We don’t keep gum in it though; I always stock it with peanut M&Ms (gum gets everywhere, especially when you add kids to the equation, and peanut M&Ms are less tempting to me so I won’t snack on them. Peanut butter M&Ms would be a different story though…). 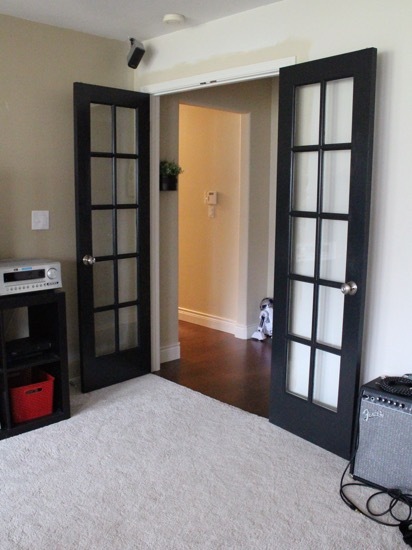 Here are the french doors when they are completely open. The door on the right only opens 90 degrees, but the door on the left opens all the way. 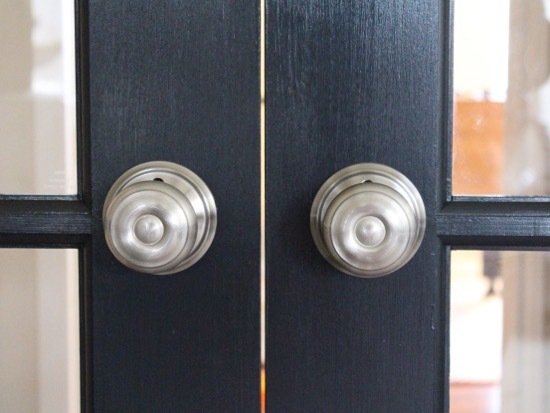 We went with the same style of doorknob as the rest of the house, but I used two dummy/false knobs per door instead of a real doorknob set. The knobs don’t turn, they are just there to push or pull the door open. 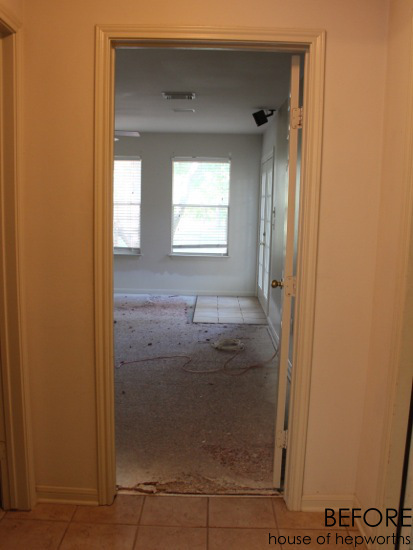 The next two pictures are the french doors closed from inside the game room. Just overlook the half-painted walls. And two more pictures of the doors open. Sometimes we will only open one door and leave the other one closed. I’m not really sure why we even do that. Probably just because we are being lazy. In fact, this picture and explanation could have been completely omitted from the post, but I already uploaded it so consider it a random bonus. And of course some before and afters! I seriously seriously cannot believe I am looking at the same room. In case you are wondering why we swapped out this door, it was two-fold. For starters, this end of the hall has zero natural light. 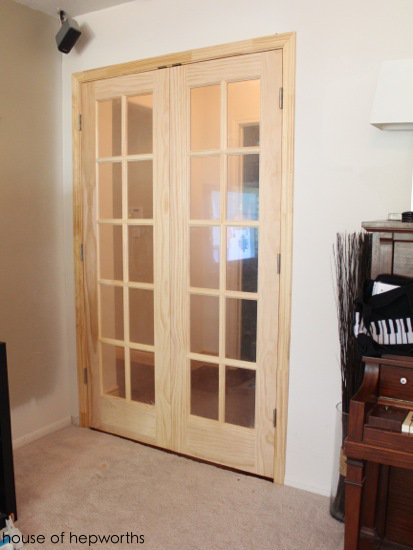 I knew by adding glass-panel doors it would bring light into the hall from the big windows in the game room. 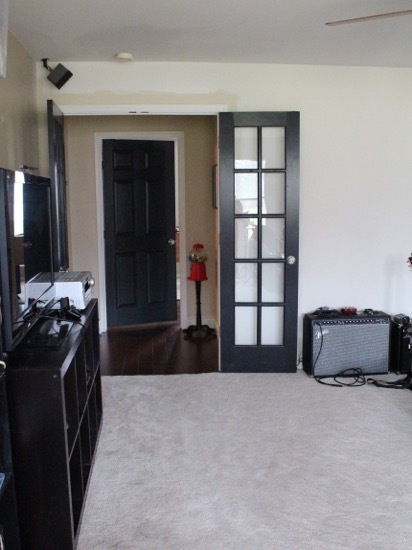 And secondly, this room is a bonus room. There is no closet so it isn’t considered a bedroom. However, with the single door it sure felt like a bedroom. 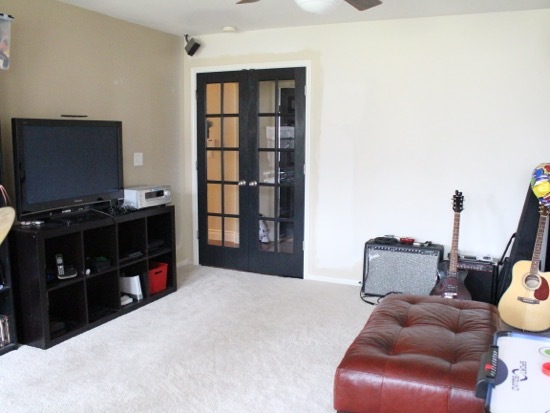 We wanted to distinguish it as a game room/den/bonus room/media room, as opposed to some weird mother-in-law suite at the end of the hall. 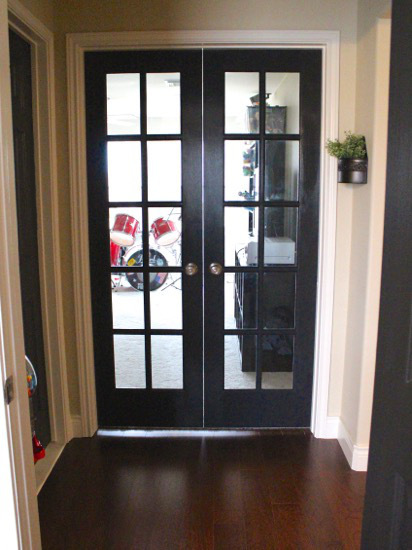 Adding glass panel french doors completely changed the feel of the room from the hall and from inside the room and made the rooms at the end of the hall feel more like a natural part of the house instead of some random addition (which it isn’t). They Look AMAZING>.. I have been trying to get my husband to paint our garage door black.. I love it.. Your posts inspire me to keep working on my home projects! Kind of off-topic, where did you get your school year photo frames above your gumball machine? I’ve been looking but all I see are the ones that are very ornate or very country. Yours are perfect. Christina, I got the frames at Target a long time ago. Unfortunately I have never seen them again since then. My daughter broke the glass in one of them and I’ve been hoping they bring the frames back so I can buy a new one. Wow, is that one AMAZING before and after! Your taste is superb. LOVE the black! I am considering painting ours black to hide all the black fingerprints we have going on. Hello. Do you mind sharing the door color and sheen. I tried BM Wrought Iron, but they look “too gray.” I think it’s the sheen which is satin finish…they are way too shiny. Mine is Sherwin Williams Wrought Iron, not BM. 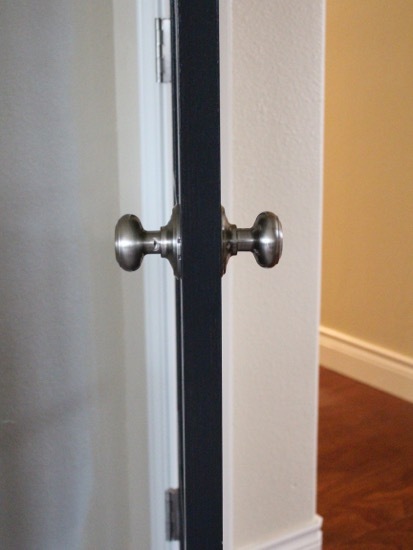 For doors my finish is satin.